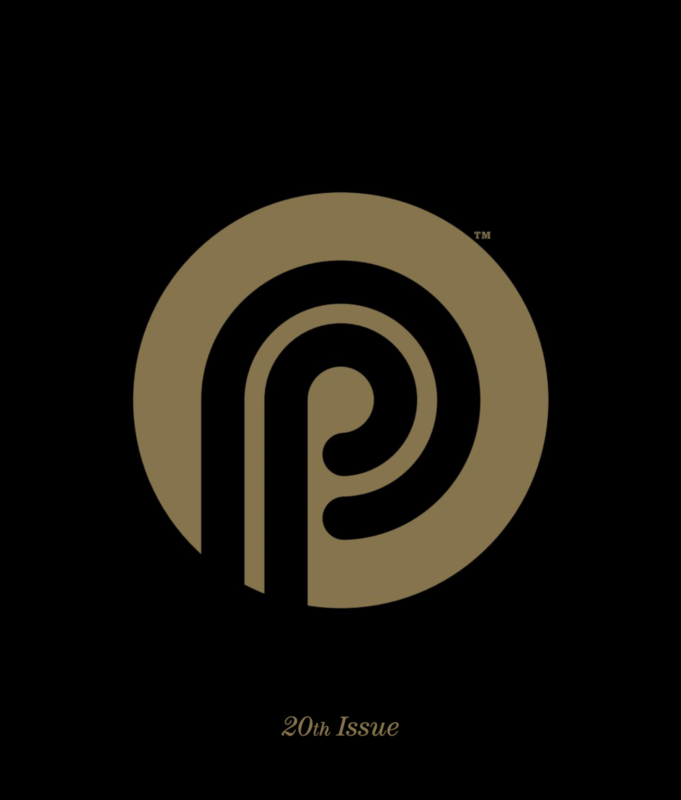 The notion of luxury has become omnipresent and universally accessible. Genuine,rare and highly personal experiences demand unique products that excel in their field. A TBlack watch is made to be personal, rare and, just like its wearer, to stand out from the crowd. 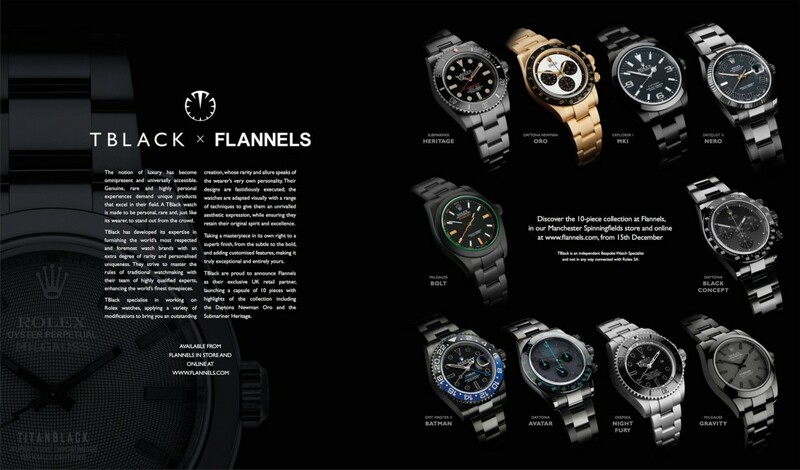 TBlack has developed its expertise in furnishing the world’s most respected and foremost watch brands with an extra degree of rarity and personalised uniqueness. They strive to master the rules of traditional watchmaking with their team of highly qualified experts, enhancing the world’s finest timepieces. TBlack specialise in working on Rolex watches, applying a variety of modifications to bring you an outstanding creation, whose rarity and allure speaks of the wearer’s very own personality. Their designs are fastidiously executed; the watches are adapted visually with a range of techniques to give them an unrivalled aesthetic expression, while ensuring they retain their original spirit and excellence. Taking a masterpiece in its own right to a superb finish, from the subtle to the bold, and adding customised features, making it truly exceptional and entirely yours. 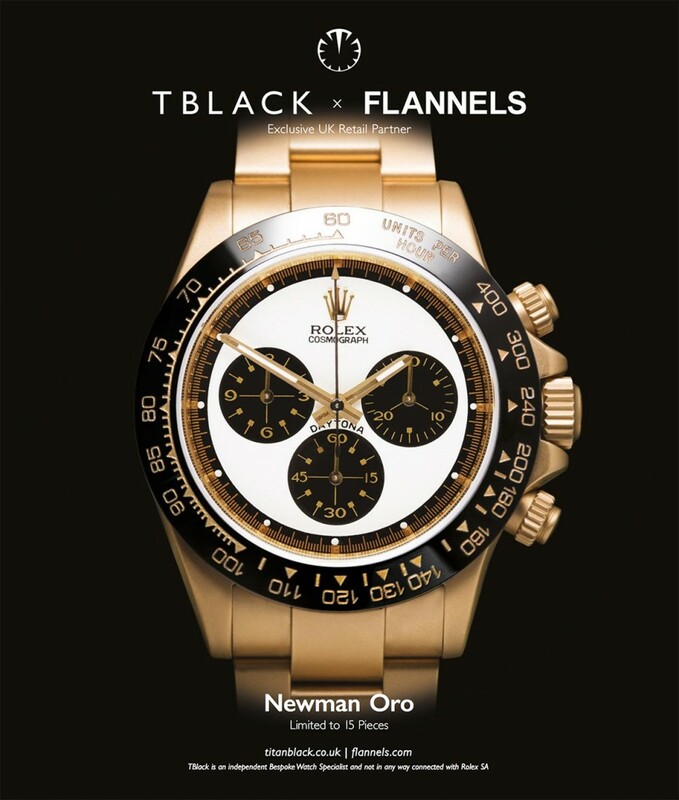 TBlack are proud to announce Flannels as their exclusive UK retail partner, launching a capsule of 10 pieces with highlights of the collection including the Daytona Newman Oro and the Submariner Heritage.